Due to some scheduled maintenance of our own vehicles, this Titan pulled extra duty as a sag wagon, accompanying us to various dealerships. 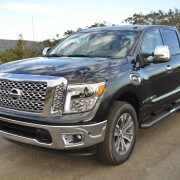 This afforded me the chance to inspect the all new Titan not only from the driver’s seat, but also from the front and rear as it transited the Interstate. 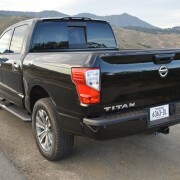 Bottom Line: the Titan is imposing to drive, and looks even more imposing to adjacent motorists. 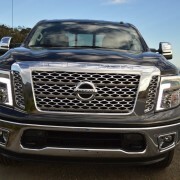 In particular, the enormous chrome grill, flanked by Batman style light clusters and underlined by a sweeping chrome bumper, elevates the Titan to King Kong status when it looms in your rear view mirror. 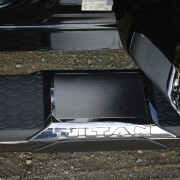 In the remote event that model ID becomes necessary, 4 inch tall “TITAN” lettering is incised across the top of the chrome grill. 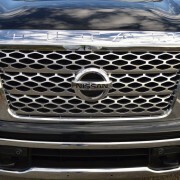 L-shaped LED running lights embedded into the front light housings instantly identify the smiley face of this monster Nissan. 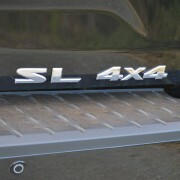 The rear view is somewhat more restrained, with a pair of bulbous vertical tail lights flanking a massive tailgate adorned with “SL 4WD” lettering. 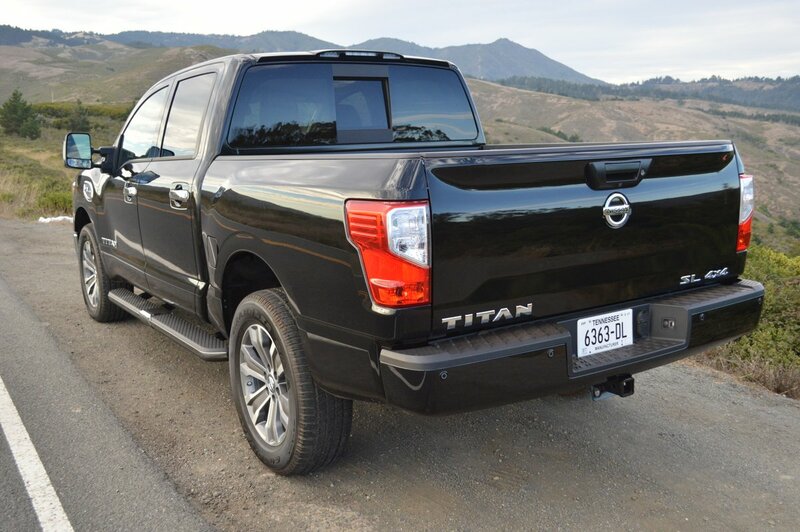 Inside the Titan’s spacious cab, you’re sitting on top of the traffic whirl, with excellent sight lines in all directions thanks to extra tall side windows on all four doors. 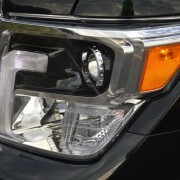 The gracefully contoured front doors droop at the forward beltline to permit welcome 3/4 front vision. 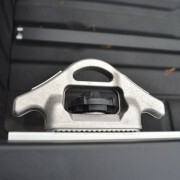 The only hang-up in this carefully orchestrated penthouse platform is the design of the optional “Extendable Folding Tow Mirrors” which are part of a $360 Towing Convenience Package that also includes a trailer brake controller and a trailer light check system. 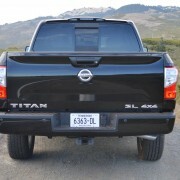 The tow mirrors are so tall and narrow that they do not reveal the presence of immediately adjacent traffic. 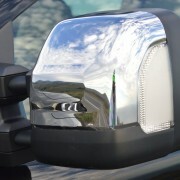 They are, however, fitted with parabolic lower quadrant mirrors that do reveal nearby vehicles. The problem with this double mirror setup is that it forces you to scan four separate panels simultaneously before reaching an informed conclusion about what’s next to you. 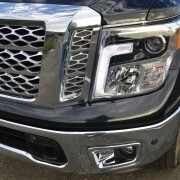 In view of this shortcoming, the Titan’s standard blind spot warning system is a welcome addition. 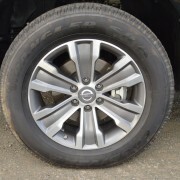 Nissan doesn’t mess around with inadequately sized wheels or tires. 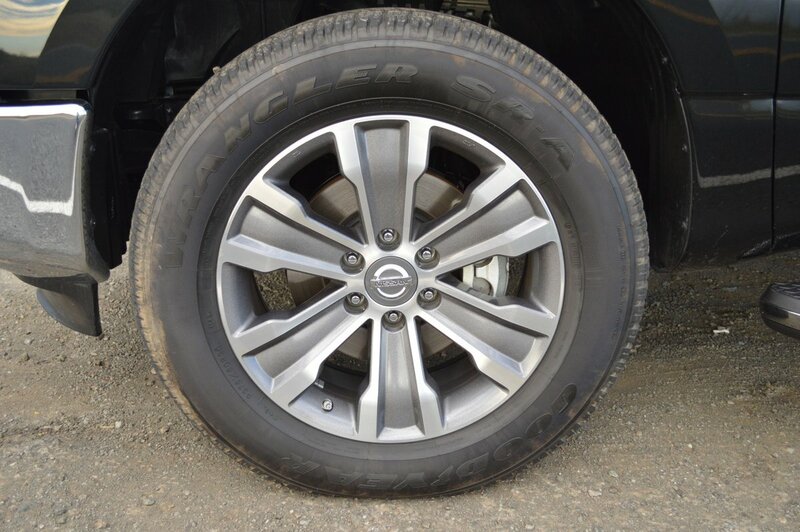 The 4WD SL comes standard with 20 inch alloy rims shod with 275/60R20 Goodyear Wrangler SR-A tires that lift the cab structure far enough into the sky to require the optional fixed running boards fitted to our truck. 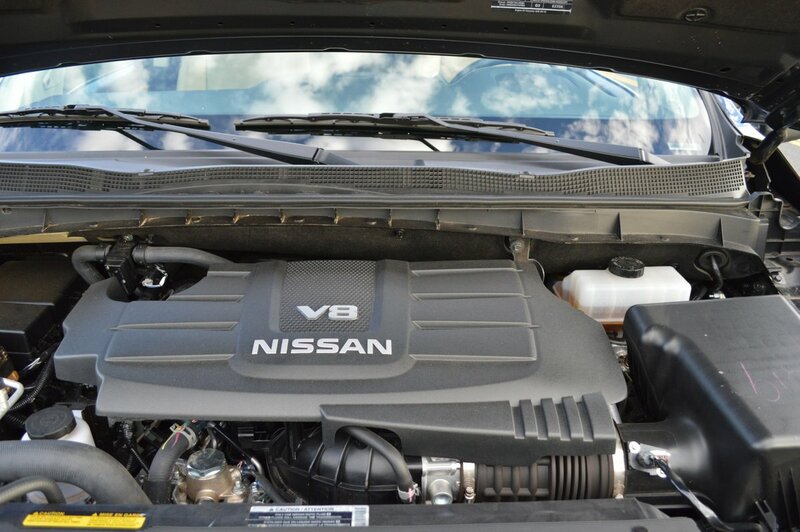 Despite clambering repeatedly in and out of the elevated cab, we never once lacked for a stable foothold or handhold because Nissan provided 3 solid grabs on either side up front, plus 2 more in back. 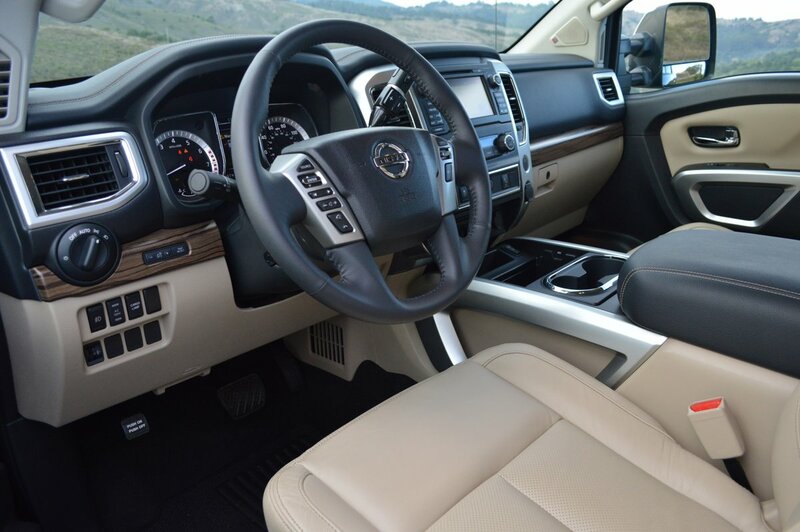 Once ensconced in the front seating positions, you will marvel at the luxury level furnishings. The dual Captain’s Chairs proved quite comfortable for short and long haul runs. 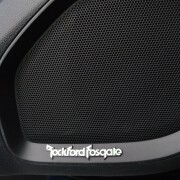 Both are heated and upholstered in perforated vinyl set off by handsome contrasting stitching. 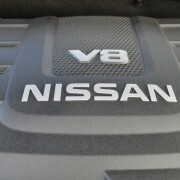 The driver’s side features 8-way power adjustment and lumbar fine tuning, while the passenger makes do with 4 positioning alternatives. In back, the rear seats offer vast legroom and headroom, but their bolt upright position mitigates against long distance comfort. 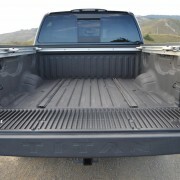 This rear bench folds flat against the rear wall of the cab, providing 15 cubic feet of lockable interior cargo space. 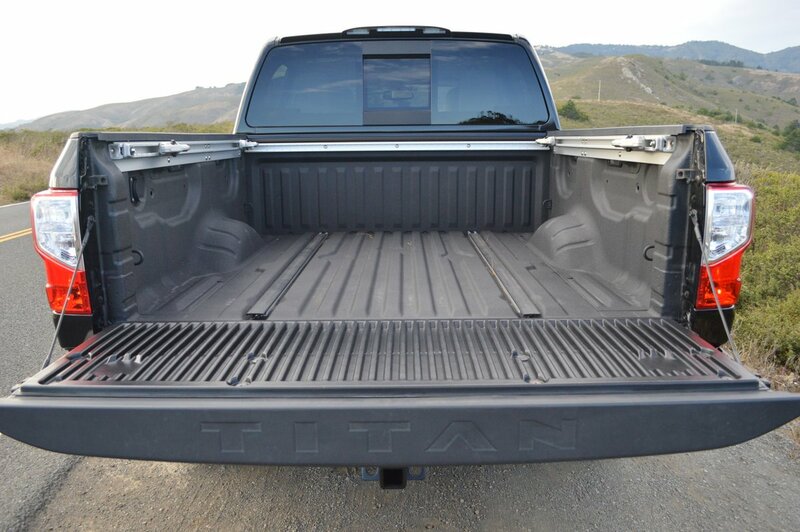 The bed of our test Titan was a real work of art with a bevy of LED lights installed just below the aluminum tie-down rail. 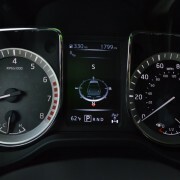 These lights activate automatically when you drop the impact-cushioned tailgate or can be individually controlled via a push button on the lower dashboard. A particularly bright overhead light embedded in the cab roof contributes extra illumination to the bed, which features standard “Factory-Applied Spray-On Bedliner” as well as the “Utili-trak Channel System with 4 Adjustable Tie-Down Cleats.” About the only item missing here is a ladder or foot step to help you climb into the bed. 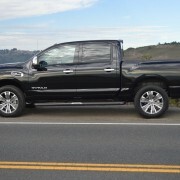 Nissan could take a clue here from the fold-out step ladder Ford provides for its F Series pickups. 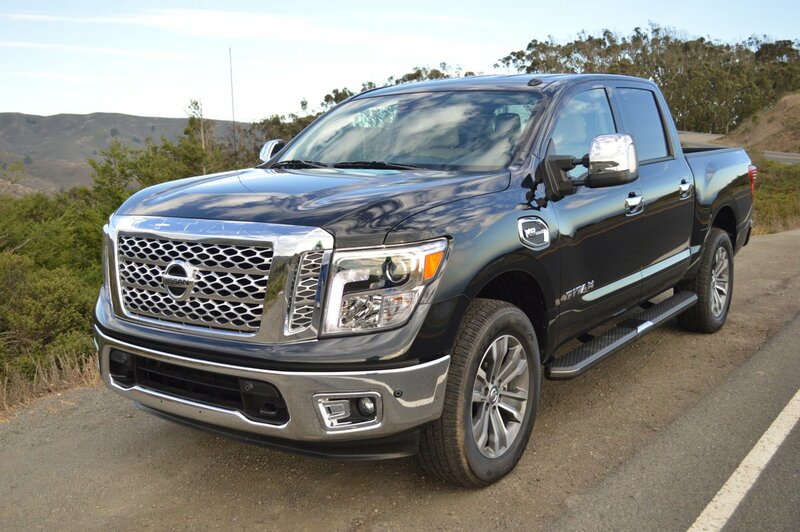 Although the Titan’s “Endurance” V8 supplied to our test truck matched the 5.6 liter displacement of last year’s engine, output is significantly improved for 2017: horsepower jumps from 317hp to 390hp and torque grows from 385lb.-ft. to 394lb.-ft. 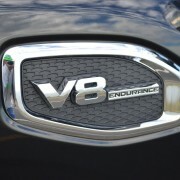 This V8 is now coupled to a smooth shifting 7-speed automatic transmission instead of the 5 speed that predated it. All in all, the power management team performs with dispatch and precision. 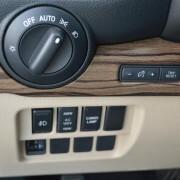 The 4WD unit features a shift-on-the-fly apparatus that allows you to select not only 2 and 4 wheel drive, but also low and hi 4WD thanks to a 2-speed transfer case. At one point, we were spinning the rear wheels while attempting to make a hill start on grass clippings, A simple shift from 2WD to 4WD provided instant thrust through all 4 Goodyears. The Titan then rocketed away like a top fuel dragster. 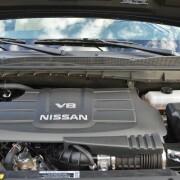 2010 Hyundai Genesis Coupe - First Ride. Not Drive, Just Ride.